Halloween is my favourite celebration, so I simply couldn’t miss the Orb’s celebration for it. Here I am dressed up as… a creepy thing! I just copied the face paint from a picture on the front of the packet that I bought. I was initially gutted at not being able to afford to dress up. I couldn’t afford to buy an outfit and I’m not crafty enough to make one from scratch. However, I discovered that you can dress up for Halloween on a tight budget without having to be crafty. 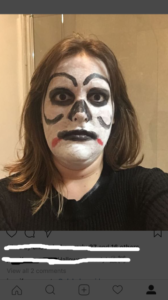 I simply wore a black jumper dress, black leggings and boots (all of which I’ve had for ages), put on some face paint that cost less than £3 from the supermarket (and can be used for other occasions) and voila! You certainly wouldn’t have wanted to bump into me in a dark alley! You don’t have to make yourself out of pocket to enjoy any spooky festivities. On the other hand, if dressing up isn’t your thing, then it is by no means compulsory. When I first arrived, I was the only one dressed up. If I had been anywhere else, this would have felt uncomfortable and everyone would be giving me funny looks or laughing at rather than with me (think of the excruciating scene in the first Bridget Jones film!) However, at Orb, there is no such thing as a standard person or standard etiquette and it is so welcoming and friendly that it didn’t feel embarrassing at all. 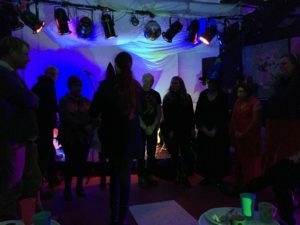 Others joined us later in witches’ hats and Jenny from the singing group came as a spider! Prior to arriving, she was frantically messaging Emma asking if anyone else was dressed up because she didn’t have time to get changed from trick or treating. She was visibly and audibly very excited to see me dressed up when she arrived! So, whatever your preferences are, you’ll fit in at Orb. The combination of the winter jumper dress and the face paint made me very hot when sitting near the light projectors. I had to ensure that I sat either near the back or near the door and that I had some time in the communal kitchen or outside to keep cool. The moral of the story? Bear comfort in mind when dressing up. Luckily everyone was able to get up as and when they needed to make drinks or get some of the delicious food made by the Orb’s very talented Grow Cook and Eat group. The cakes and buns were very aptly decorated with blood! No staff, service users or volunteers were harmed in the process of making it (or so they tell me…). The unknown origin of the blood was flavoured with ginger which complimented the lemon, lime, raisin and cream cake and buns beautifully. I managed to give ATI worker Carolyn a fright when looking at her with hungry face paint tinted eyes and exposed canines as I divulged the blood coated feast! As always, the music was an outstanding product of the Orb staff, service users and volunteers. The Good, the Bad and the Beardy were not at all bad and John’s saxophone added a unique harmony to their rocky and indie charm. Susie sang along to a Greatest Showman song and her enthusiasm for it shone through in her performance. Gloria did a smashing performance of a couple of indie songs. Based on her amazing performance, I wouldn’t have otherwise known that they weren’t songs that she’d written herself. Her guitar and vocal combination gave the songs a rock, indie and country feel which was very moving to listen to. I would love to see her perform again! The Natural Voice Singing group joined us and performed a beautiful piece for us to watch before getting all of us to join in. Despite Emma’s very clear and concise instructions, Andy and I still got a bit lost with the words which gave us a laugh! 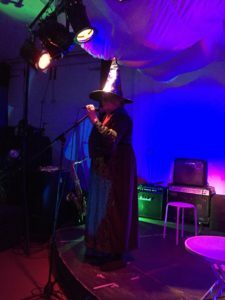 Of course, a Halloween party would not be the same without some Halloween themed music, and there was some aplenty! While the performers were setting up the stage, we had theme tunes including The Adam’s Family and Halloween to enjoy. 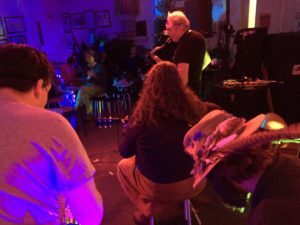 Once again, Orb certainly didn’t fail to deliver a fantastic evening of as much or as little socialisation as people felt comfortable with and lots of fantastic talent to enjoy!